About Tom Worth Publishing Co.
Jon and I are committed to helping you succeed at handicapping thoroughbred horse racing by building your analytical skills so that you can reason and think on your feet, whether it be at the track or online. We also enjoy having many experienced handicappers onboard with us who have been very generous over the years in contributing their ideas and strategies for handicapping the races to the TIPS Report and our various spot play methods. As a way of a background, Jon, son of the late Tom Worth, is passionate about handicapping, writing about & analyzing the races and passing on his knowledge and experience to others - and quite often he learns from others as well! Jon greatly enjoys talking with handicappers, so please give him a call sometime. You can find our phone number at the bottom of every page. Having both been educators by trade, before Tom's passing, Tom and Jon always took an educational approach when developing and writing their materials with their goal being to help you enjoy a lifetime of successful handicapping. Tom learned how to handicap from an Army buddy while serving in China during World War II. Back state-side, Tom began studying and writing about thoroughbred handicapping in the 1940s. He found that not only did he greatly enjoy it, but he had a strong talent for it. During the late 1940s and 1950s, Tom wrote for American Turf Monthly and Turf and Sports Digest, sometimes under the pen name of "Ira Johnson". Tom Worth founded Tom Worth Publishing Co. in about 1956, when he began publishing his own methods and continued to do so right up to his passing in 1997. We have several of Tom's earlier methods listed in our online store, and we plan to put up several more before the start of 2015. After retiring as a school principal, Tom founded his own school for children with Attention Deficit Disorder, a dream come true for him. Jon, a few years after graduating from college with a degree in English along with a teaching certificate, took an active role in this special school by teaching students along side of his dad. Most of Tom's adult life was dedicated to educating others, whether they be school students or handicappers. Jon began handicapping in 1984, (after learning from his dad in the early 1980's), working alongside his father and helping him with many of the latter chapters of Tom Worth's highly acclaimed POPS and TIPS Methodology. Together, they published Place-to-Win for Routes, Place-to-Win for Sprints and Show-a-Profit: A Maiden Method. Like his dad, Jon has a strong passion for handicapping. I myself have a degree from Boston University and have a love for writing and working along side of Jon, my husband, with various aspects of Tom Worth Publishing. In my free time I sew and quilt. Jon and I are very active in our church and greatly enjoy our "church family." And, as some of you know, I recently battled a major illness which dramatically slowed us down. I am happy to report that as of this writing in the summer of 2014, I have a new lease on life, and we are working 110%!! Also, we have a daughter heading to college for her Freshmen year. How the years have flown! We're proud to report that she graduated in the top 5% of her class! And also, as you may know, with Tom's blessings and early contributions, Jon and I founded the TIPS Report in 1993, which continues to this day, and is a 24-page bi-monthly publication that analyzes the races and past performances by way of handicapping angles, (which we call TIPS or tipoffs), and real-life case studies of races that either Jon or a contributor handicapped. No prior knowledge of "TIPS handicapping" is needed to gain value from the TIPS Report. Jon has also published the Improving Beyer Figures, The Big 4 + 1 and The Fitness Factor spot play methods to name just a few. Jon collaborated with Frank R. to publish a revision of Tom's 1985 method, The Only One, titled The Only One II. Jon is always available by phone or e-mail for questions or comments, or just conversation. Have a question right now? You may reach Jon at 401-921-5158. Please keep in mind we are on the east coast! We invite you to sign up for our free newsletter to receive essays related to horse racing from Jon and/or to stay up to date on new products and special offers. Please be sure to bookmark our website so you can visit often. 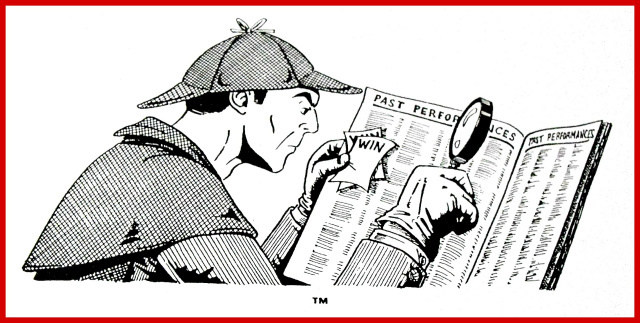 And while you are here, please take a look at our handicapping publications and the TIPS Report. We would love for you to join our handicapping community and become a subscriber to the TIPS Report. Subscription plans start at a one issue subscription.